CHARLOTTE, N.C. (RNS) Another voice from the past is telling the stories of the Holocaust. 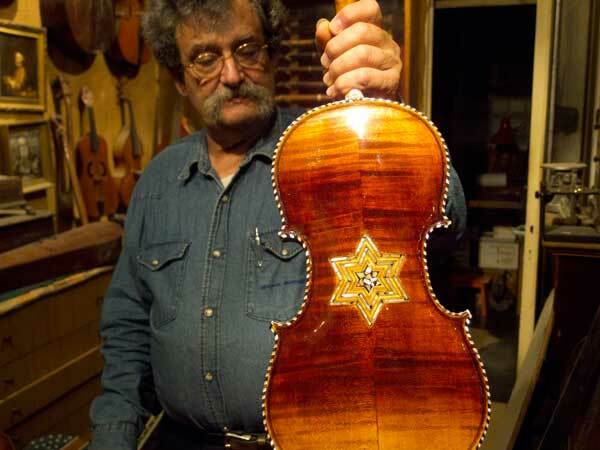 Violins that outlived the owners who played them in the death camps and Jewish ghettos are being brought back to life by Amnon Weinstein in his shop in Tel Aviv. As Yom Hashoah (Holocaust Remembrance) gatherings occur around the world in April, 18 violins tracked down and repaired by Weinstein will be unveiled in Charlotte, N.C.
A dozen public concerts, worship services and other programs throughout the month are expected to attract thousands who are drawn to the music, and the history behind each instrument — the first time the violins will be shared with the public in North and South America. Weinstein hopes he can bring the violins to other communities, in a bid to recall the 6 million Jews and 5 million others who perished at Hitler’s hand. Weinstein, 72, lost some 380 relatives in the Holocaust — “cousins from here to eternity,” he said. These violins, he said, symbolize the power of music to outlive evil. They represent the dead, and speak for the aging survivors whose voices are being silenced by time. Like a detective, Weinstein, a violin-maker, has spent more than a decade scouring the Internet, talking to survivors’ relatives, literally searching attics and basements for violins presumed lost to time. Several violins are believed to have belonged to some of the thousands of klezmer musicians who played traditional Jewish folk music across Eastern Europe. These violins are inscribed with the Star of David. Today, klezmer music remains popular in synagogues and at festivals across the U.S. and Europe. One of the violins tracked down by Weinstein is beyond repair, no longer able to make music. Weinstein believes it was played in the rain at one of the camps. It, too, bears witness, he said. Nick Strimple, a Holocaust music scholar who teaches at the University of Southern California in Los Angeles, said music played in the camps and ghettos has a complicated legacy. The Nazis ordered inmate musicians to play marches as other inmates were sent off to forced labor assignments. “It was easier for the Nazis to keep them regimented,” he said. At the Dachau camp, Strimple said, inmates would put on secret concerts in the barracks and latrines, sometimes on homemade instruments. USC’s Strimple, who is not Jewish (he directs the music at Beverly Hills Presbyterian Church), is moved by Weinstein’s crusade, and what he believes it symbolizes. Dan Napolitano, director of teacher education and special programs at the United States Holocaust Memorial Museum in Washington, appreciates the power of artifacts to bring the story to life. The display of more than 3,000 shoes taken from people who died at the Majdanek camp in Poland, for example, is one of the most talked-about by the 33.2 million people who have visited the museum since it opened in 1993. In synagogues and community squares this month, candles will be lit and prayers said to remember victims and survivors of the Holocaust. In that same spirit, Napolitano believes the violins can help people better understand the scope of what happened. Weinstein likes to tell of the violin he was working on one day in his shop in his native Israel. He found himself scraping away black gunk until he realized what it was. The violin had been played by an inmate in the orchestra at Auschwitz, a short walk from the gas chambers and chimneys. This entry was posted in Arts & Media, Entertainment & Pop Culture, Judaism, Religion News Service, Social Issues and tagged Holocaust, Israel, Nazi, Poland, United States Holocaust Memorial Museum, Yom Hashoah. Bookmark the permalink.